The Mica and Ahmet Ertegun Graduate Scholarship Programme funds full-time graduate degrees in various subjects in the Humanities. Established in 2012, the programme is supported by the generosity of Mica Ertegun. Ertegun Scholars also benefit from exclusive use of Ertegun House; a fully modernized, non-residential building, built in 1808, located at the heart of Oxford’s academic community. Ertegun House provides an environment for study and camaraderie that is unique at Oxford and unparalleled in the world. Each Ertegun Scholar has his or her own dedicated space for research and writing, opportunities to participate in social occasions and lively lectures, performances, and other activities developed expressly for the Ertegun Scholars. In addition, there is access to Wi-Fi, online access to Oxford libraries and state of the art audio-visual equipment. The Director of Ertegun House, a distinguished member of the Oxford faculty, is available full-time as a mentor to the Ertegun Scholars and a resource to help them make the most of their experiences at Oxford and at Ertegun House. As Ertegun Scholars, the world's top graduate students in the Humanities are brought together in a unique setting that fosters dialogue across academic disciplines, across cultures and across generations. Ertegun Scholars will leave Oxford prepared to be leaders; not only leaders in their chosen fields, but also leaders of global thought and opinion and leaders of positive action for the betterment of humanity. For further information, including scholar and alumni profiles, news and events, please see the dedicated Mica and Ahmet Ertegun Graduate Scholarship Programme in the Humanities website. Decisions are expected to be made by late March 2019. If you have not heard from us by this time, then please assume that your application has been unsuccessful. Due to the volume of applications we receive, we regret that we are unable to contact unsuccessful applicants individually or provide feedback on applications. You must be applying to start a new full-time graduate course at Oxford. Classics (including classical archaeology); English Language and Literature; Fine Art (DPhil in contemporary art history and theory only); History (including history of art and the history of architecture); Linguistics, Philology and Phonetics; Medieval and Modern Languages (covering most European languages and their literature); Music; Oriental Studies (including Far Eastern and Middle Eastern Studies, and the study of a wide range of languages); Philosophy; Theology and Religion; and the Humanities Division's interdisciplinary courses. Scholarships will be awarded on the basis of academic merit and the additional criteria outlined on the Ertegun supporting statement form (see Related documents on this page). Ertegun staff and scholar profiles and Ertegun alumni profiles can be found on the dedicated Mica and Ahmet Ertegun Graduate Scholarship Programme in the Humanities website. 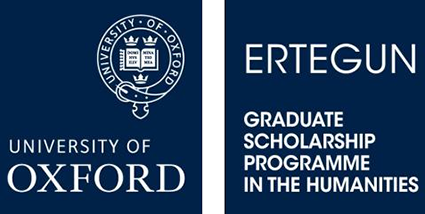 In order to be considered for this scholarship, you must select ‘Mica and Ahmet Ertegun Postgraduate Scholarships in the Humanities’ in the University of Oxford scholarships section of the University's graduate application form and submit your application for graduate study by the relevant January deadline for your course. See the Courses page for the deadline applicable to your course. You must also complete an Ertegun supporting statement (see Related documents on this page) and upload it, together with your graduate application form, by the deadline. To be eligible for consideration for this scholarship, applicants must be successful in being offered a place on their course after consideration of applications received by the relevant January deadline for the course. Course applications which are held over after the January deadline to be re-evaluated against applications received by the March deadline, or course applications which have been put on a waiting list, are not eligible for scholarship consideration.